The Blues Scale for Tenor Saxophone and Bb instruments by Andrew D. Gordon is he feels, one of his most important books because of the nature of the blues scale and how it is used to improvise in many styles of contemporary music. The image to the right shows both the C and A (relative minor of C) Blues scales.Throughout the book there are patterns of these two scales both individually and together creating a huge library of improvisational melodic lines to choose from. 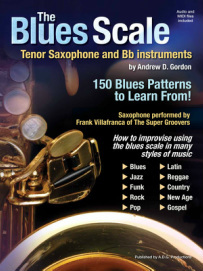 The Blues Scale for Tenor Bb instruments by Andrew D. Gordon is he feels, one of his most important books because of the nature of the blues scale and how it is used to improvise in many styles of contemporary music. The book consists of 20 groove:.Pop, Rock, Blues, Jazz, Funk, R&B, Latin, Gospel, New Age, Reggae, Calypso, Acid-Jazz, Country.